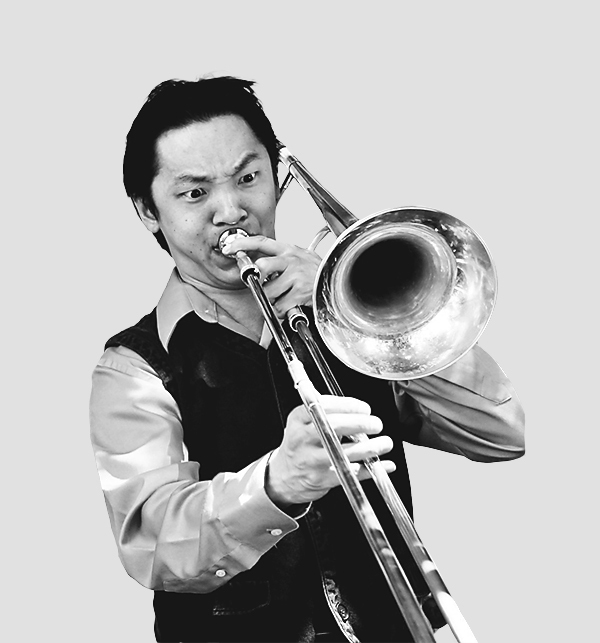 Brandon Au (Trombone/English Baritone/ Tuba) teaches trombone and performs traditional jazz regularly in the Sacramento area. Currently involved in the Sacramento Traditional Jazz Society’s TJP (Traditional Jazz Project), he works with several schools and their traditional jazz programs. Before graduating with a music performance degree at CSU Hayward jazz ensemble, and again with the Stanford Jazz Orchestra. He went on to become a member of Dave Eshelman’s Jazz Garden Big Band, The New Lowdown Jazz Band and lead the Section 7 Jazz Band. Today, He can be heard regularly with Polly’s Hot Paupers, Harley White Jr. Jazz Orchestra, Anthony Coleman II’s Simplistic Big Band, Element Brass Band, Nostalgic Swing, The Brandon Au Quartet, The Crescent Katz and the Ron Cunha Big Band. He has also subbed with Steelin’ Dan, Fulton Street Jazz Band and Cell Block 7. His own group The Crescent Katz, can be heard every 1st Saturday at Clark’s Corner (originally Shakey’s Pizza).